This essay explores northern attempts to stamp out “treasonous” speech during the Civil War. The voluminous case files of Levi C. Turner, Associate Judge Advocate for the Army, and Lafayette C. Baker, special Provost Marshal, two officials at the heart of the effort to suppress subversion, supplemented by newspaper accounts, provide detailed evidence of the workings of the federal program to quell dissent outside the usual procedures of civil law. These efforts reveal uncertainties about the nature and limits of free speech, especially when expressed in the public arena, and the complicated and layered character of loyalty. Although stalwart unionists insisted that the line between loyalty and disloyalty was clear, the attempts to curb supposedly disloyal discourse suggest otherwise. The workings of the program privileged the accusers, local men (and some women), who were willing to denounce their neighbors’ public utterances. Whether those accused were disloyal or merely had ordered their allegiances differently than their accusers, whether the accusers were telling the truth or lying, the consequences of being denounced were dire. Without any information about the accusations and those who had made them, without any procedure for defending themselves, those caught up in the attempts to curb disloyalty faced incarceration for an unknown period of time in prison facilities far from home. Their plight highlights the limits of free speech and the simplification of the definition of loyalty during the Civil War. Scholarship on the attempts by Confederate government officials to negotiate with the United States during the last year of the war tends to fall into two categories. Some historians chart the increasingly desperate attempts to modify the terms of inevitable reunion and emancipation. Others demonstrate the futile instances of an absence of meeting of minds with an exchange of incompatible positions of independence on one side and reunion with emancipation on the other. There is a different and more contingent interpretation of the interaction between Confederates and northerners off the battlefield. In their endeavor to establish an independent nation state in a time of war, Confederates looked forward to and planned for the future and knew that in peacetime their most important commercial and diplomatic relationship would be with the Union. They rationalized events and developments on and off the battlefield, as well as the attempts at negotiation themselves, as stages in pursuit of the desired quest of a state of harmony with the United States. Confederates also believed this state of affairs would also be either in the best interest of northerners as a whole or at least elements within the Union, such as the states of the Midwest or Democrats. Confederates therefore believed compromise on both sides was both possible and desirable, albeit to be facilitated by the battlefield. Individuals who passionately disagreed about domestic policies—for example President Jefferson Davis and his vice president, Alexander Stephens, agreed on this point. Finally, while these would-be negotiators hoped to preserve both slavery and independence, they were also prepared to consider creative arrangements to address what they presumed to be the U.S. government’s concerns. What Confederates thought the terms of the agreement should be with the Union reveals much about what they expected their nation to become in the future. Adrian Brettle is Andrew W. Mellon postdoctoral fellow at the American Civil War Museum. His book, A Vastly Different World: Confederate Ambitious Planning for a Postwar Global Role, is under advance contract with the University of Virginia Press who plan to publish it in 2020. Joseph J. Casino is an Adjunt Professor of History at Villanova University. He previously served as the Director of the Philadelphia Archdiocesan Historical Research Center for over 25 years. Julie Roy Jeffrey is a professor emerita and former member of the history department at Goucher College. Her distinguished career inlcudes numerous titles on the west and the abolitionist movement, including The Great Silent Army of Abolitionism: Ordinary Women in the Abolitionist Movement (2008). Sager, Robin C. Marital Cruelty in Antebellum America. Reviewed by Diane Miller Sommerville. Hager, Christopher. I Remain Yours: Common Lives in Civil War Letters. Reviewed by Jonathan Engel. Quigley, Jr., William F. Pure Heart: The Faith of a Father and Son in the War for a Perfect Union. Reviewed by Timothy D. Grundmeier. McCardle, Linda S. A Just and Holy Cause: The Civil War Letters of Marcus Bethune Ely and Martha Frances Ely and Scythes, James M. This Will Make a Man of Me: The Life and Letters of a Teenage Officer in the Civil War. Reviewed by Kathleen Logothetis Thompson. Williams, Timothy J. and Evan Kutzler. Prison Pens: Gender, Memory, and Imprisonment in the Writings of Mollie Scollay and Walsh Nelson, 1863-1866. Reviewed by Beth Kruse. Sodergren, Steven E. The Army of the Potomac in the Overland and Petersburg Campaigns: Union Soldiers and Trench Warfare, 1864-1865. Reviewed by John H. Matsui. 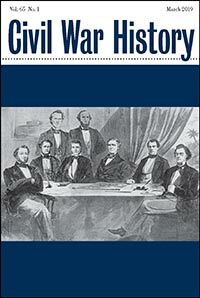 Steplyk, Jonathan M. Fighting Means Killing: Civil War Soldiers and the Nature of Combat. Reviewed by Earl J. Hess. Ural, Susannah J. Hood’s Texas Brigade: The Soldiers and Families of the Confederacy’s Most Celebrated Unit. Reviewed by Walter L. Buenger. Hess, Earl J. Civil War Logistics: A Study of Military Transportation. Reviewed by Wayne Wei-Siang Hsieh. Gannon, Barbara A. Americans Remember Their Civil War. Reviewed by Robert Cook. Cook, Robert J. Civil War Memories: Contesting the Past in the United States since 1865. Reviewed by Barbara A. Gannon.